Vice President Mike Pence made an unannounced stop to tour a vandalized Jewish cemetery in Missouri, where he helped clean up the toppled graves and strongly condemned anti-Semitism. He also praised the local Jewish community. On Wednesday afternoon, Pence and Missouri Governor Eric Greitens (R) visited the Chesed Shel Emeth Cemetery in University City, where more than 150 headstones were toppled and broken on Sunday evening. The damage was concentrated in an area holding the cemetery’s oldest graves. 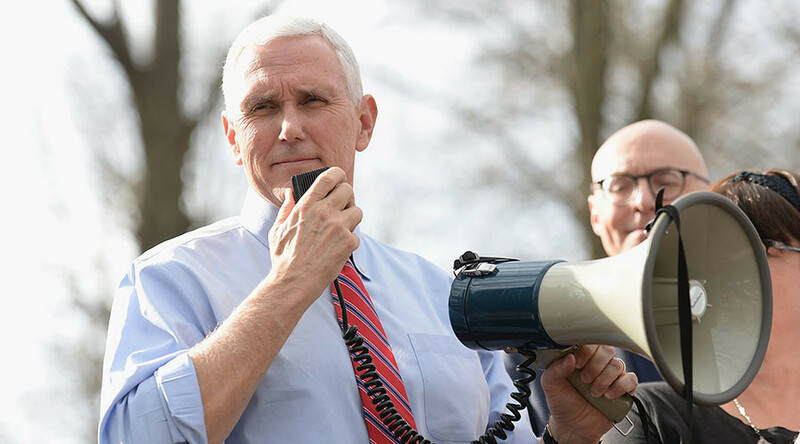 “There is no place in America for hatred, prejudice, or acts of violence, or anti-Semitism,” Pence said, speaking through a bullhorn. “I must tell you that the people of Missouri are inspiring the nation by your love and care for this place and the Jewish community,” he told volunteers who were there to clean up the vandalism. “I want to thank you for that inspiration. For showing the world what America is all about." Pence and Greitens joined more than 100 volunteers who were cleaning up the cemetery, straightening the headstones and assessing the damage. The two men raked leaves. They also heard a prayer from a rabbi during an interfaith vigil. The Muslim community has raised nearly $100,000 to repair the Jewish cemetery. Earlier on Wednesday, Pence visited the Fabick Cat headquarters in Fenton, another St. Louis suburb. There, he also spoke out against the vandalism and anti-Semitism during a speech on job growth. He began by citing President Donald Trump’s remarks against hatred at the National Museum of African American History and Culture in Washington, DC on Tuesday. Along with the vandalism at the Chesed Shel Emeth Cemetery, there have been several strings of bomb threats called in to Jewish community centers across the US since the beginning of the year. On at least four different occasions, beginning January 9 and as recently as Monday, were targeted by what a security company says may be a serial caller. Trump has been heavily criticized for not condemning the recent spate of threats and incidents of vandalism targeting the Jewish community quickly or strongly enough. Several people on social media said that Pence’s remarks and visit to the cemetery were more in line with what Trump needed to have done to placate the critics, but others said that what is needed is action, not more words.